"This is like the Mona Lisa of all paranormal activity that I've experienced with my own eyes. I can die a happy man now." Throughout the years, many ghost facts have been established about the St. Augustine Lighthouse that sits on the Atlantic Coast. When it comes to haunted places in Florida, this particular lighthouse is considered to be one of the most popular. The main reason for this is the location. This structure is located in what is referred to as the “Nation’s Oldest City” or the “Ancient City”. St. Augustine is a location with a violent and extensive past. Due to the age of the city itself, there are many ghost facts surrounding many of the historical buildings and locations throughout the area. All in all, the city as a whole is considered to be the most haunted out of all haunted places in Florida. In this paranormal guide on haunted lighthouses, you will learn many interesting ghost facts about the St. Augustine lighthouse. 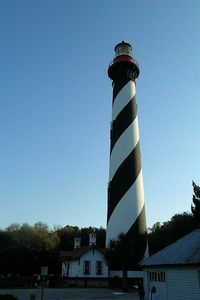 The lighthouse in St. Augustine is considered to be one of the tallest among lighthouses located throughout the United States. It is one hundred sixty five feet past sea level and contains an amazing two hundred nineteen steps that visitors must climb in order to reach the observation deck that oversees the Ancient City. The land that the lighthouse rests upon has had a sea guiding structure on it since the early 1500s. However, the lighthouse that currently stands has only been on the property since the 15th day of October 1874. 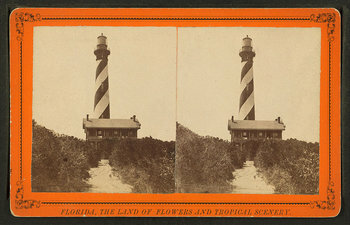 Prior to this, the lighthouse that guided the sea ships in the Atlantic Ocean was only forty feet tall and was constructed of wood, contained only a lamp, and displayed a large number of flags. In order to understand the ghost facts associated with the St. Augustine Lighthouse, it is important to gain an understanding of the history of the location. By knowing a bit of the history of the area, you will be better able to appreciate and understand why this is considered to be one of the most haunted places in Florida. Despite the fact that the current lighthouse was finished in the year of 1874, the actual construction originated in the year of 1871. Shortly after the completion of the lighthouse, work started on a home that would serve as a residence for the lightkeepers and their families. This was designed to house up to three individual families. This structure was designed using Victorian architecture and was completed within the year of 1876. It was common for a head keeper to oversee the structure and operation and for that keeper to have up to two additional assistants to assist in the responsibilities. In the year of 1955, lightkeepers were no longer necessary – only lamplighters were required. These individuals did not live on the grounds. The ocean is often associated with many tragedies. This is particularly true of the Atlantic Ocean. Tropical storms and hurricanes throughout the years have caused many ships and liners to sink and many to lose their lives. In addition to this, many ships have been unable to withstand the harsh waves and currents of the open waters. As a result, many water vessels have collapsed under pressure and have sunk into the dark depths of the Atlantic Ocean. One of the ghost facts associated with the St. Augustine Lighthouse is that it appears – throughout history – that the light emitted from the tower not only attracts the living, but also the souls of those that lose their lives at sea. For well over one hundred fifty years, many ghostly tales have been told about these lost souls by those that worked at and lived around the St. Augustine Lighthouse. These stories have contributed to its reputation as one of the most haunted places in Florida. The next story associated with this haunted Florida lighthouse surrounds a little girl dressed in clothing that is appropriate to the era of the early Twentieth Century. Upon investigating deaths that occurred in the late 1900s, it was found that a small girl was killed by a train that often ran near the grounds of the lighthouse during the time period. The documentation surrounding this child’s death is not at all specific enough to give a set age, but the individuals that have claimed to have seen her spirit tell that she looks as if she is ten to eleven years of age. Many witnesses to this real ghost claim that she is often seen walking around the structure that the lightkeepers resided in as well as the tower itself – just behind the bushes. Paranormal investigators feel that this young girl could be a residual haunting, or a recording of past events that occurred during her lifetime. She is believed to be connected to the St. Augustine Lighthouse in some way or another. When researching ghost facts associated with this haunted lighthouse, there is another story associated with children. While there are many different versions of the story, the most basic story is that in the 1870s, when the current lighthouse was being constructed, two children of a lightkeeper as well as another girl that may have been the daughter or a maid or slave were playing on a railcar that was used to bring construction supplies in from the ships on the ocean. Unfortunately, the railcar crashed into the violent ocean. It is believed that the African American child was able to successfully escape the violent sea, but that the other two girls were not successful and died. Since then, many reports have been made of a small girl lingering in and around the lightkeeper home, as well as the tower itself. Today, many still claim to see this young girl staring out of the window of the lightkeeper residence. While the stories of children spirits are the most commonly expressed ghost facts associated with the St. Augustine Lighthouse, several other spirits are believed to haunt the grounds as well. One tale involves a man who lost a large fortune in the stock market crash that occurred in the year of 1929. It is believed that he was so shaken over his financial loss that he took his own life by hanging himself. However, it is important to understand that no documentation actually supports this claim. Those that recognize the St. Augustine Lighthouse as one of the most haunted places in Florida do not underestimate the fact that this story could be true, though. As a matter of fact, most of the people that believe that this structure is haunted believe this story. By learning the ghost facts of this structure, you can quickly gain an appreciation of the fact that the St. Augustine Lighthouse is one of the most haunted places in Florida. Get the directions, view photos, and read the reviews and traveler tips for the St. Augustine Lighthouse.